This year, more than in previous years, the Collab Lab has invited students to join us in our professional learning experiences. For example: for Parent Teacher Nights we have invited students to showcase examples of learning with technology; on in-service days we have asked students to present spark sessions to staff; and, for our Teaming on Tuesdays (ten-minute class visits with optional follow-up workshops) we have invited students to join us and share examples of how their teachers use Schoology. The more we include students, the more we realize the impact of including their voice, and the more we realize we should include students more often! Each and every student connection gives us an opportunity to learn from their unique perspectives; we gain new insight to reflect on and revise our practice. 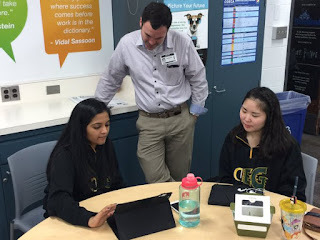 For some specific examples of how student voice impacted our professional learning, check out this previous blog post, Teaming on Tuesdays: Next Steps with Schoology. Another way we include student voice during professional learning is during visits to classes. 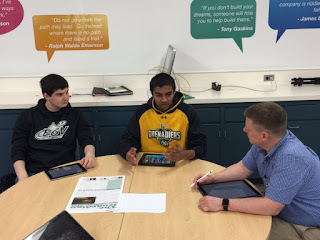 A recent example is from last Friday when the Collab Lab hosted a site visit for the Midwest Apple Distinguished Schools Showcase. Educators from area schools and staff from Apple had the opportunity to visit 5 different classrooms. In all of those classes we had the opportunity to walk around and talk to students, and in a few classes teachers paused their instruction for 5-10 minutes for student demonstrations and Q and A with students. Students shared examples of how they collaborate and do peer editing with Schoology Media Albums, how they can work at their own pace to master learning with Schoology quizzes, how they use presentation tools and video creation tools to demonstrate their learning and publish their work, and how they share their work beyond EG via social media. We'd like to give a shout out to Christina Barnum, Joe Bush, Carmen Ruiz, Mark Heintz, and Amy Burke -- and their students! -- for so willingly opening their classrooms to our visitors. This week we will be visiting Lisa Martineau's Yearbook class to learn from her students about how they develop skills in creative thinking, problem solving, collaboration and teamwork, and leadership. Look for a blog post on that soon! Do you have student work you would like to share and showcase? Do you have ideas for including student voice in professional learning experiences? We'd LOVE to hear from you! Leave us a comment, email us (CollabLab@d214.org), or stop by the Collab Lab!